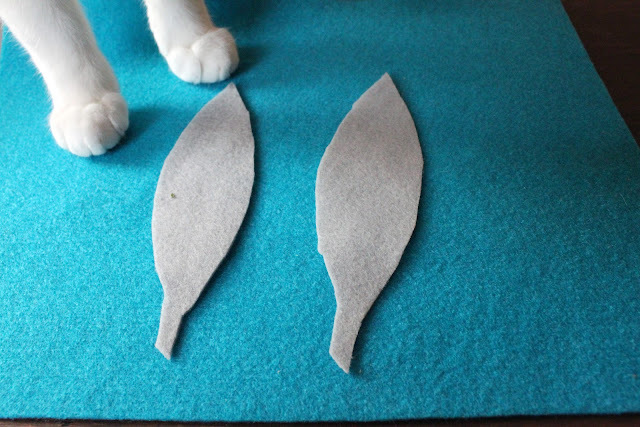 on my honor...: DIY: Thanksgiving inspired cat toys! 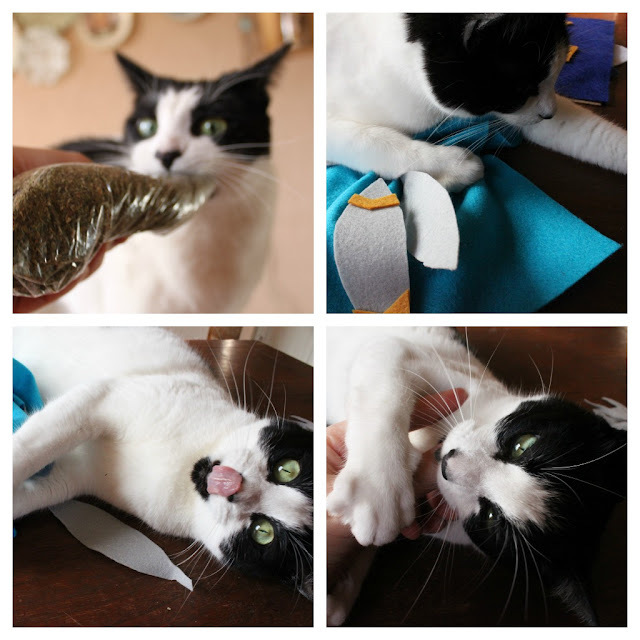 DIY: Thanksgiving inspired cat toys! In the spirit of giving thanks, I decided I would give thanks to Peanut (even though she's bad all the time) and make her some Thanksgiving inspired handmade cat toys! These are pretty easy to make, and they don't require much in the way of supplies or skills. 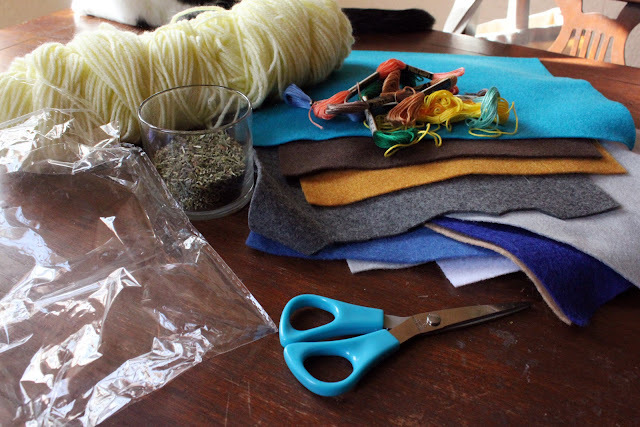 You will need some felt, catnip, embroidery thread, needle, scissors, crinkly trash, and something to stuff the toys with--I used some acrylic yarn I had around. I purchased these sheets of felt at JoAnn's for $0.35 a sheet. 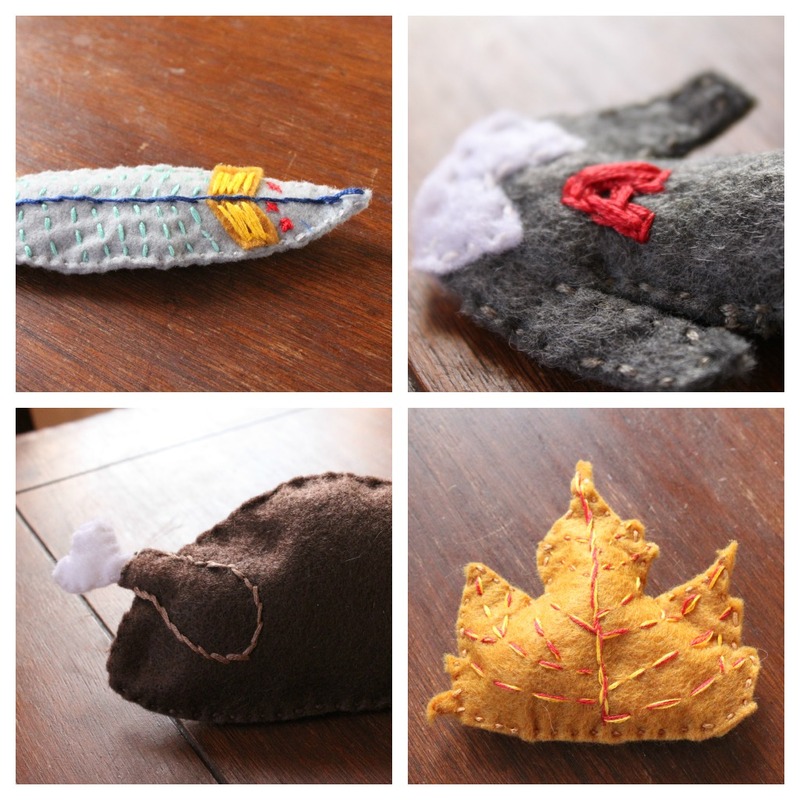 If you are making these toys for your own cat, they will try to help. 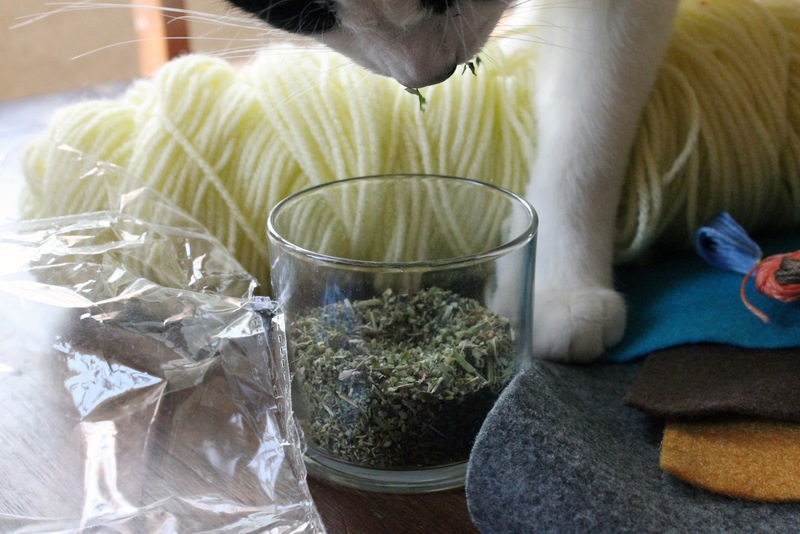 Peanut went on a rampage and ruined everything for about 10 minutes after she got her paws on some of this catnip. 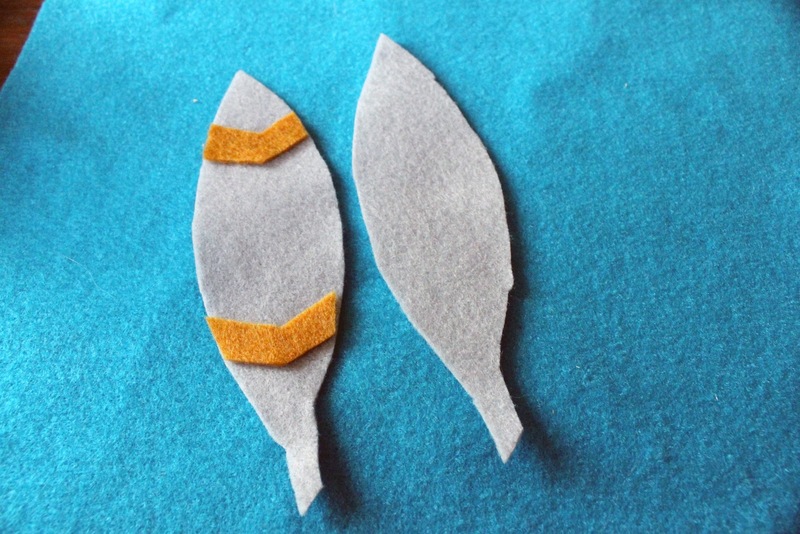 Once you have restored order (or at least some semblance of it) cut out two identical feather-shaped pieces of felt in the color of your choosing. Add a few felt bits of flair to jazz up the feather and add some dimension. It's a cat toy, so it doesn't have to be perfect. 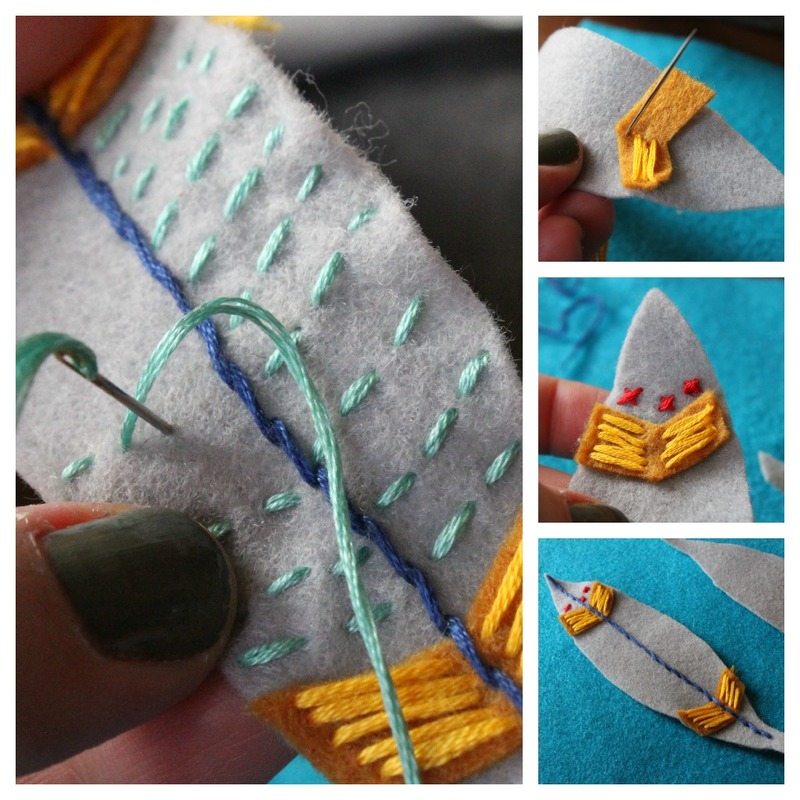 Next, you'll want to embroider some detail on the feather. I just went for it and added different lines and shapes. Again, it's a cat toy, so don't spend hours on the detail--that would be silly! After you're satisfied with the level of detail, it'll be time to stuff the toy. I stitched my feather together around all but one of the sides. You'll need to grab your catnip that you've probably had to hide somewhere because of the swarming cats. You'll also want to cut off a piece of the crinkly waste packing I mentioned earlier. The idea here is to have something that makes noise and sounds like it's dying for the cat's enjoyment. Very, very carefully stuff the toy with yarn, crinkly bits, and catnip. Try very hard to keep the kitties away. I'm very aware of what this feather with the catnip looks like. Stitch up the final side, knot the end, and you're ready to go! I made Peanut a feather, a pilgrim/Scarlet Letter inspired dress, a turkey (because she is a turkey), and a maple leaf. Peanut could hardly wait to play with all the toys. She particularly like the Scarlet A dress. Before long she was on her handmade cat scratching post upstairs and going nuts. I hope you make your kitties some toys and they love them as much as Peanut did! Cute but one warning. Using yarn to stuff the toys is NOT a good idea. When the cat tears the toy apart--and she definitely will eventually--she will swallow the yarn, then you will have a visit to the vet and possible surgery when it gets wrapped around her intestines. I'm in cat rescue--we hear about this happening all the time. Thanks for the tip! I've done this several times before and never had a problem with her ripping them open, but it's definitely something to watch for. In the future, I'll probably take Christina's advice and just cut the yarn up into pieces. Thanks, I'm glad you like them! That's so cute that your kitty has a stocking. Peanut might have to get one this year too. I don't have a cat, but my sister does, and this is too cute! Tell her to make some toys! They're really not very hard and a lot cheaper than buying them! My cats would LOVE this. I might have to make them some for Christmas. Might even turn the feather idea into an ornament. It's so pretty. Oh good idea! Make some for your cats and for you! Oh good, I hope your little cat loves them! Usually I just make little squares of fabric filled with fiber-fill and catnip for my cat, but these are super cute. I love the turkey and feather ones! I'm new to raising pets, and I wanted to entertain the fat...*ahem*..the cat as much as I could.. so I bought him a couple toys. No reaction. I also tried to attract his attention with dried fishes and little treats. Nothing. I tried with a plushie mouse. Nothing at all. Arianna, great job taking in a homeless kitty! I think catnip is definitely worth a try. Although some cats could care less about catnip, other cats are totally gaga for it. I vote to give him some and then get out of the way. He could turn into a catnip fiend! While we're on the subject of entertaining cats, there's nothing my cat, Matilda, loves more than a pile of papers. Assemble a bunch of newspaper or tissue paper and drag a string through the pile (beneath a few papers) or toss a little ball in there. It works like a charm. Also, brown paper bags. It's basically her favorite thing. Good luck! I've tried with the papers, and he enjoyed it a lot. He enjoyed it so much that yesterday he slept on the papers, instead of sleeping on grandma's flower bed. Cicero is an awesome cat name. That would depend on the effect you want your toy to have on your feline friend. Valerian is to help sleep and relaxation whereas catnip is for play and excitement. Personally, my cat doesn't need any help with sleeping, he's more than happy to snooze anytime, anywhere!! Play however is good for his old arthritic joints and to keep his weight in check especially now that he's of an age where he would rather snooze in front of the warm fire instead of going out to catch mice! I don't have a kitty :-( but my sister does. I know what Mr. Bigglesworth will get for Christmas! Well, Mr. Bigglesworth will be one excited feline! Oh good! I love that your cats are named Egon and Winston. Well done!!!! 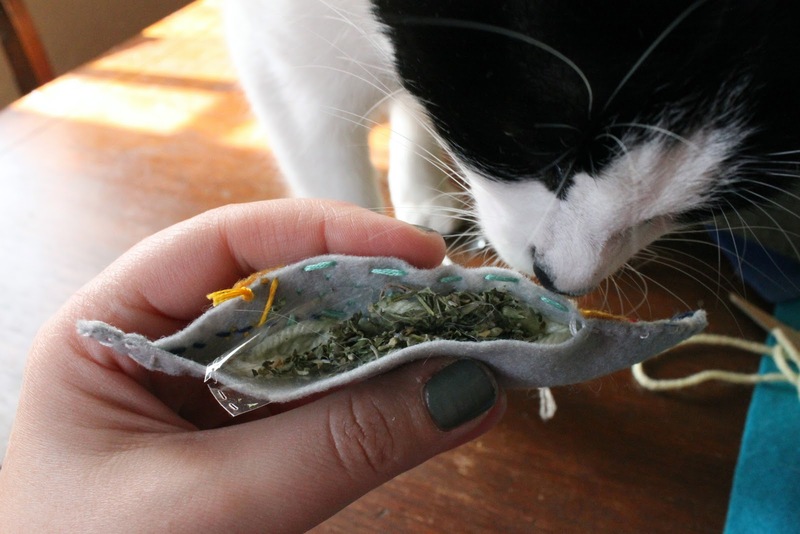 Stuff with strips of potato chip bags makes it crinkly & cats don't swallow them....of course with cat nip...they love em! Great idea! I will definitely have to give this a try for my two cats! Also, I love the photos... it looks like something my cats would do while doing this project! Got to love them! Thank you for the post! You made the directions for each step easy to follow and duplicate in the same fashion. I can't say that I am a very crafty person myself, but I was very pleased with my results as was my cat Shadow. I am so tired of going out to the pet store and buying him toys that he loses or destroys. These ideas have definitely saved me money. That is great submit and also i love to learn this kind of submit. your website will be great and you also have got excellent employees within your website. great revealing keep writing. 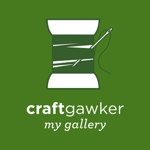 Hi your blog is very informative. Nice idea and tips to create handmade cat toys. Cats are like kids so, toys plays very important role in their life. Toys give your loving cat company when they are alone. To buy online cat toys go to Pets Department. Home and Away: Thankful for my ladies. Peanut & Purl: Secret knits revealed!